@JuliaTsygan @ddmeyer Hi! I do a whole bunch of math in programming class. Only a small bit of code in math class. Darn curriculum. @dandersod huh, so are you saying this is uncharted? what code in math class do you do? What math in programming and why? @JuliaTsygan I show the code I made and they help fill in the missing pieces from the complex number math. This line of code takes the current value of x, adds one, then stores it back into the variable x. “=” in most programming languages is an assignment operator, and “==” is an equality operator. Ich. I think there ARE ways to teach a bit of math through programming. I just think that it’s use is limited. I presented on one of these topics at NCTM’s Annual Meeting in April of 2016, and at Twitter Math Camp in July 2015. All my resources are found here: Geometry from Scratch. Click through to get more details, but it boils down to the idea that you can be successful teaching Geometry or Middle School students about angles and polygons by having them use focused play in Scratch. They’ll discover the Exterior Angle Theorem after they’re asked to draw a hexagon. Likewise you can teach Geometry, Algebra, or Middle School students about slopes and lines by having them draw lines by making stairs. Can you teach a big part of the math curriculum through programming in math class? Sure! In the same amount of class time? Nope! The left picture is from a student who was having trouble landing on a specific topic and so just ended up making many smaller ideas into one project. You can read more in her blog post. This student is using polar coordinates that she learned in PreCalculus class, trigonometry with radians, and has used a proprortion to work with the colors (the map command). Later on the student uses the % operator, which calculates the remainder so that she can cycle through a set of drawing commands. The picture on the right is from a student who was going to extend the Geometry from Scratch polygon angles from above. But the move and turn commands were too limited for him, so after a 5 minute talk, he learned how to use polar form of coordinates to easily make a n-gon from a given center. Keep in mind, that this student hadn’t heard of polar coordinates before and mastered them to get these shapes. I’m excited to see how much knowledge he’ll bring to PreCalculus next year when polar coordinates are officially “taught” to him. Here’s his blog post for his project. This student designed a 3d model with code to create this fantastic piece of math art. It is a series of cocentric circles that represents the digits of pi, the center of the circle has a small circle with height 3. The next circle has height 1, then 4, then 1, … Here’s his blog post with code samples. 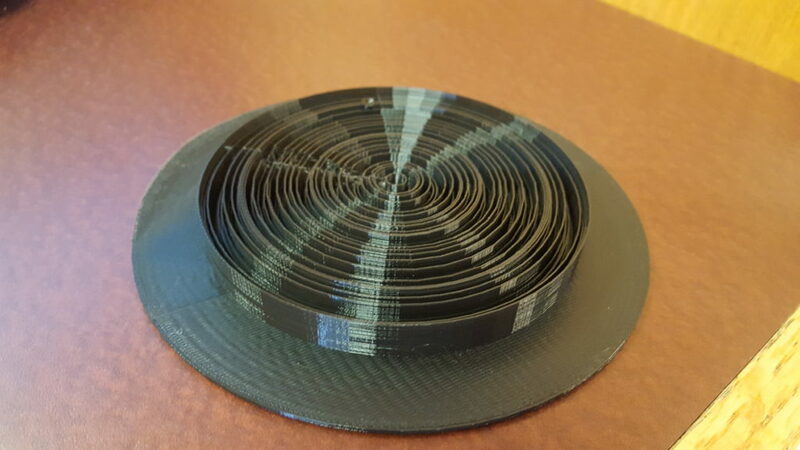 He used 3D polar coordinates as well, and he made many connections to his project and the integration unit of his calculus class (rotational volumes). This graphics program uses polar coordinates (yep again! 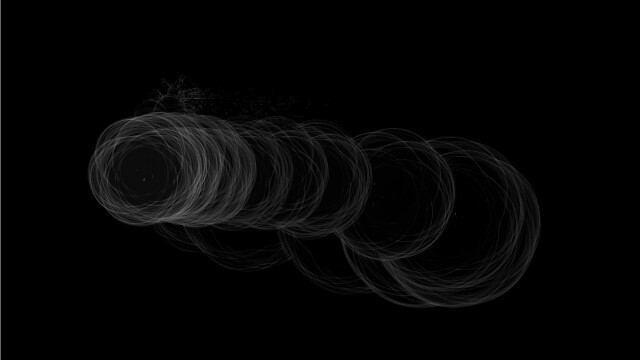 ), transparency, circles, trigonometry, lines, triangles and so much more to make some fantastic images. His blog post with more info. This student did a project that has a grid of rectangles in a 3D environment and he rotates them in 3D based on a periodic pattern and the mouse position. Some really great use of translations, rotations, and 3D geometry. Here’s his blog post. 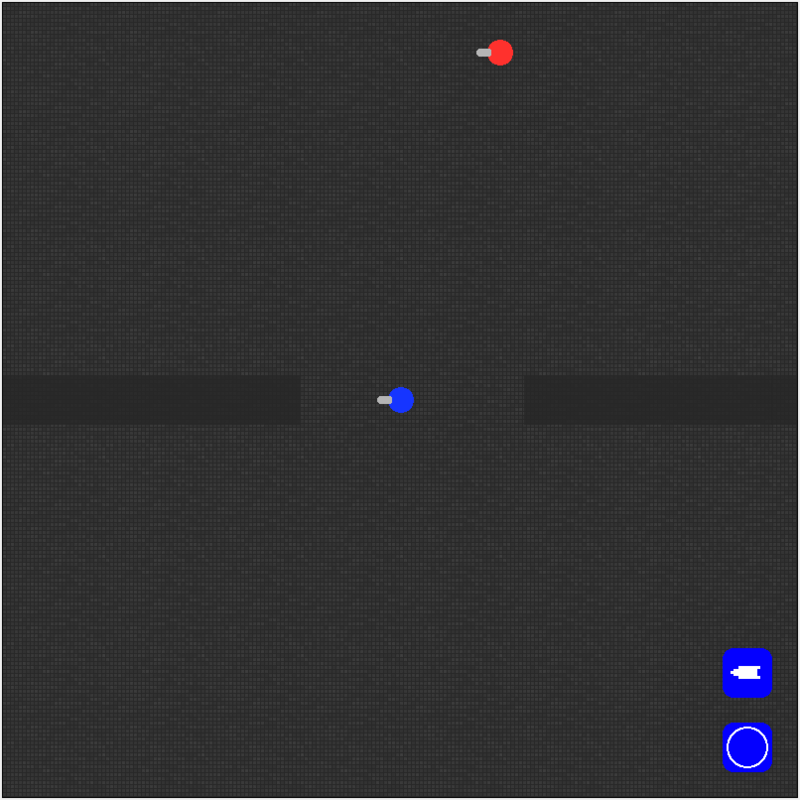 This student made a tank shooter game where the user (blue) battles the AI enemy (red). The really great math that this student had to apply and learn was the use of arctan to get an angle between two coordinates so that he could shoot between the coordinates. Impressive math. Blog post (sadly without the code or a link!). Lastly, here’s a student’s work on making a bunch of bouncing coins. The math that this student had to work through was using vectors to make a gravity system and to obey Newton’s first law of motion. This senior hadn’t taken any math class that had vectors, nor had he taken any physics class. Yet he mastered the idea of velocity vectors to get the motion to work properly. He also was somewhat successful in making a collision system (from scratch! ), a very hard task. His blog post. I don’t know. That feels like much of my progress into adulthood. I’m less definitive about statements. I know that I don’t know a whole lot. Here is the first one…. I don’t understand what your JS apps are doing? Is there a website that describes what they are doing? The 0th item is the current approximate value of root 10, where the 11th value is almost “it”. The simple function activates the repeat loop one time, starting with x=50. You can do right shift and “source code” to access the text. Hi Dan and thanks for this wonderfully elucidating post. I wonder, would it be possible to assign tasks that target specific skills/knowledge – such as now that you know that one mathart project uses vectors, and another uses polar coordinates, we could assign these same (or similar) projects to math students? You’re absolutely right they need to learn programming first, but that could happen within the context of the first couple of such tasks, or outside of math class somehow. Also, have you experimented with programming the calculator? Even just making students program calculators to implement formulas such as for solving quadratics, using sine rule, etc, would force students to do some thinking, mathematically. I need to catch a student and try it out to see more specifically what kinds of thinking they engage in. Sadly, I have very little wiggle room to play around and have the students learn programming in class. I’m afraid if I asked them to learning programming outside of math class that it would eat into other things that we do that are aligned to the curriculum. I would like to bring in student programming artwork and talk about the math behind the scenes, but the structure of that is showing them a solution to a problem that they never had. The magic was the student who made the program themselves who had to really learn the math that was required. I have played around with programming on the calculator and found it to be simply awful compared to what they can do with other technology, but we are a lucky school district with a lot of tech (1-1 chromebooks). I think that the input methods and the weirdness of the graphing calculator programming languages would be a huge hurdle to jump.